CHILLY START: Temperatures are generally in the 30s across the northern half of Alabama this morning, but a few colder spots have dipped into the upper 20s. Look for sunshine in full supply across the state today, with a high in the 56-60 range for north and central counties of the state. Tonight will be clear with a low in the 30s, and we stay dry tomorrow with a partly sunny sky along with a high in the 60s. FRIDAY AND THE WEEKEND: A surface front will approach from the north Friday; the sky will become mostly cloudy and we will mention a chance of scattered showers. Nothing heavy or widespread, and the high Friday afternoon will be in the 60s. That front will stall out somewhere around the Tennessee state line. For the weekend, the sky will be mostly cloudy Saturday and Sunday with highs mostly in the 60s. And, with the stalled front nearby, we will need to mention a chance of showers both days. If you have something planned outdoors, just understand we are not forecasting a “wash-out” kind of situation, but from time to time you will deal with some rain thanks to a passing shower. No risk of severe storms, and I doubt if we hear any thunder over the northern two-thirds of the state. Impossible to give specific start/stop times; just be ready for an occasional shower. NEXT WEEK: A few scattered showers are possible Monday, then rain becomes widespread across the state Monday night and Tuesday. Rain with this feature could be heavy at times, and a few storms are possible as well. Then, the weather looks mostly dry for the latter half of the week. 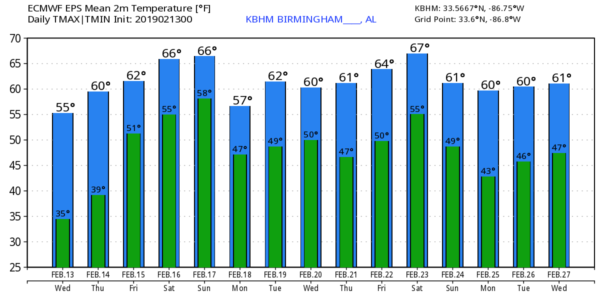 Afternoon highs next week will be mostly in the 60s… still no sign of any excessively cold air for Alabama or the Deep South through the rest of February. Please note this is a very active weather pattern, and understand the forecast can, and probably will change, especially for events out in the 4-7 day time frame. So keep updated with fresh weather information as you plan events. ON THIS DATE IN 2000: Late in the day and into the early morning hours of the 14th, severe thunderstorms spawned six tornadoes over southwestern Georgia that killed 19, injured 202, and caused $35 million dollars in damages. An F3 tornado hit southern Camilla, killing 11 and injuring 175 in the town. I have a weather program this morning at Woodland Forrest Elementary in Tuscaloosa… look for the next Weather Xtreme video here by 4:00 this afternoon. Enjoy the day!